If the Nintendo 3DS XL 2015 directional pad is malfunctioning or not working at all, this replacement guide will help you fix the problem. Ensure your device is powered off before proceeding. Failure to do so may result in electrical shock or damage to the device. Place the 3DS upside down. Remove the game card, headphones, charging cable, stylus, or anything else that may be connected to the device. Using a JIS #0 screwdriver, loosen the two black screws on the back. The screws are held in place by captive washers and should not be completely removed. Once the screws are loosened, pry open the back cover. 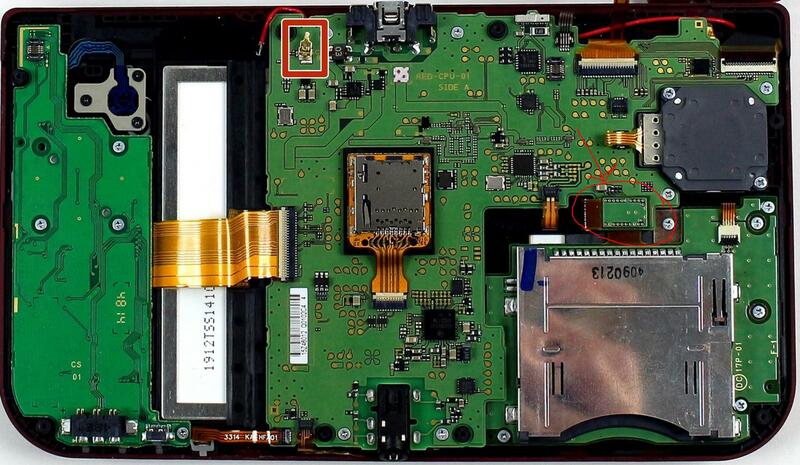 The battery is located on the left hand side of the 3DS - to remove, use the small gap located at the top-middle and pull up with a pointed tool. Using a JIS #000 screwdriver, remove the six 6mm screws around the edges of the secondary cover. Using tweezers, carefully pop out the rubber bumpers located at the top side of the 3DS. Removing them will reveal another two 6mm screws. Remove these screws using a JIS #000 as well. To separate the cover, carefully lift it up and away from the hinges (in order to clear the headphone port), then pivot it towards the hinges to expose the circuit boards. Don't fully remove the cover yet, or you may damage the delicate ribbon cable that still connects it to the motherboard. Use a pair of tweezers to lift away the two plugs that latch the L/R/ZL/ZR button ribbons to the motherboard. You can now remove the back cover completely and set it aside. Using tweezers, gently pull the gray clamp underneath the circle pad ribbon connector upwards from the right side. Then slide the ribbon out of the ZIF connector. Using a JIS #000 screwdriver, remove the two 8 mm screws securing the circle pad. Lift the circle pad casing upward to remove it. There will be some friction, but it should not require excessive force. Locate the gold terminal plug with a red cable at the top left of the motherboard. Using your fingers, carefully pull the plug straight upward to remove. Use a pair of tweezers to disconnect the single ribbon connector. Don't do what we did -- be very careful not to pull on the red cable. Using tweezers, gently pull the five marked ribbons out of the ZIF connectors along the sides of the motherboard. Note that these ZIF connectors are held in place by friction and do not have locks -- lifting the flaps on these connectors will break them! Three of the ribbon connectors have plastic clamping flaps that cover the ribbon to prevent slippage. Use the tweezers to flip them up before ribbon removal. When reassembling the device, be sure to flip the ZIF clamps back down. While the SD card reader is shown as removed in this photo, it is optional for the removal of the motherboard. Using a JIS #000 screwdriver, remove six 4mm screws along the edges of the motherboard. Carefully pivot the motherboard 90 degrees toward the hinges to reveal two more ZIF connectors on the underside of the motherboard. Both have latches that must be flipped up. The left, longer latch is black; the right, shorter one is white. Flip up the flaps, slide the ribbons out and remove the motherboard. Note which way the ribbons slide into their connectors carefully, as they are different. Remove five 5mm screws from the game card reader panel using a JIS #000 screwdriver. The game card reader can now be removed and replaced. Using the JIS #000, remove four 3mm screws from the square panel. Remove the panel by lifting it upward. Pry off the gray rubber covering. Take out the directional pad using tweezers and replace. FYI: Under Tools you state a Philips #000 is needed but in the instructions you have JIS #000. Submitted an edit! I corrected some of the bit sizes in the instructions as well (in our repair, a #00 was never used). Total lack of information in these fix instructions about the new black zif connectors. The ones we have all be used to for years are mention in detail (eg. the one for the toddle stick). But nothing about the new ones that supply the home button, mic etc. I have today totally wrecked a customer’s new 3DS XL as a direct result of following this guide. As these new zifs were not mentioned I thought (stupidly) they should just be flipped up but obviously this destroys them. Whoever makes these guides would know these clips to be a problem but neglected to warn would be fixers about them (was it deliberate as I cannot think why you would neglect such a crucial fact). I am still not sure how they operate -. Yours felling stupid for trusting ifix and also very let down.